Scientists from the United States and China have designed a range of diatom-like nanostructures, which may ultimately have far-reaching applications in new optical systems, semiconductor nanolithography, nano-electronics, nano-robotics and medical applications, including drug delivery. Diatoms are tiny, unicellular creatures, inhabiting oceans, lakes, rivers, and soils. Through their respiration, they produce close to a quarter of the oxygen on earth, nearly as much as the world's tropical forests. In addition to their ecological success across the planet, they have a number of remarkable properties. To achieve a range of diatom-like nanostructures, researchers borrowed techniques used by naturally-occurring diatoms to deposit layers of silica, the primary constituent in glass, in order to grow their intricate shells, according to a new research, published on Monday in the advanced online of the journal Nature. Using a technique known as DNA origami, scientists from Arizona State University (ASU) led by professor Hao Yan, in collaboration with researchers from the Shanghai Institute of Applied Physics of the Chinese Academy of Sciences and Shanghai Jiaotong University led by professor Chunhai Fan, designed nano-scale platforms of various shapes to which particles of silica, drawn by an electrical charge, could stick. The new research demonstrates that silica deposition can be effectively applied to synthetic, DNA-based architectures, improving their elasticity and durability. "We demonstrated that the right chemistry can be developed to produce DNA-silica hybrid materials that faithfully replicate the complex geometric information of a wide range of different DNA origami scaffolds. 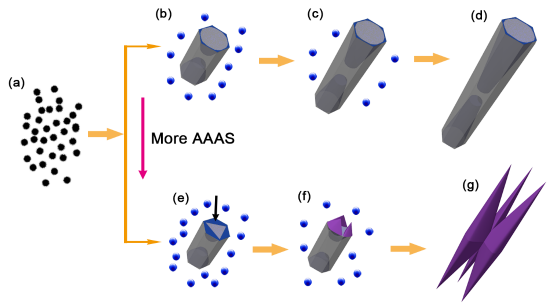 Our findings established a general method for creating biomimetic silica nanostructures," Yan was quoted as saying in the university's press release.